Instant Replay Review upheld HP Umpire Joe West's out call in the bottom of the 7th inning of the Giants-Dodgers game. With two out and three on, Dodgers batter Andre Ethier hit a 2-2 fastball from Giants pitcher Santiago Casilla on a line drive to right fielder Hunter Pence, who threw to catcher Buster Posey as Dodgers baserunner R2 A.J. Ellis arrived at home plate. 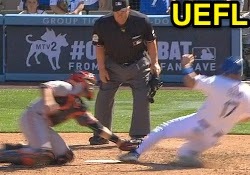 Upon Instant Replay Review as the result of a challenge by Dodgers Manager Don Mattingly, West's ruling that Posey successfully tagged Ellis while Ellis was off his base was affirmed, the call was correct. At the time of the review, the Giants were leading, 7-2. The Giants ultimately won the contest, 7-2. This is Joe West (22)'s first Instant Replay Review/Challenge of 2014. Joe West is now 1/1 (1.000 Affirmation Rate) in Instant Replay Reviews during 2014. Crew Chief Joe West's crew is now 1/2 (.500 Affirmation Rate) in Replay Reviews during 2014. Listed Replay Official Crew Chiefs: Larry Vanover, Jeff Kellogg. This is the 34th Instant Replay Review of the 2014 MLB Regular Season. Dodgers Manager Don Mattingly is now 0/1 (.000 Affirm Rate) in Instant Replay Challenges/Reviews during 2014. Umpires are now 21/34 (.618 Affirmation Rate) in Instant Replay Reviews during the 2014 MLB season.